The TaylorMade Pebble Beach Invitational attracts professional and amateur golfers of all stripes to Pebble Beach. The play in this unique tournament is fierce, the setting is breathtaking, and it&apos;s free for spectators. The Invitational gives spectators a special chance to watch their favorite golfers in a more intimate and relaxed environment; viewers can even walk down the fairway right behind the golfers. The TaylorMade Pebble Beach Invitational is the only golf tournament in which players from the PGA, the LPGA, the Champions and the Nationwide Tours compete head-to-head for the same purse. Teams of four amateurs also play during the tournament; each team plays with a different pro each day. The tournament takes place at Spyglass Hill Golf Course, Del Monte Golf Course and Pebble Beach Golf Links. On Sunday, 32 professionals and 10 amateur teams will compete for a piece of the $300,000 purse. Admission is free to the public. Many of the hotels at Pebble Beach offer a view of the play at the TaylorMade Pebble Beach Invitational. 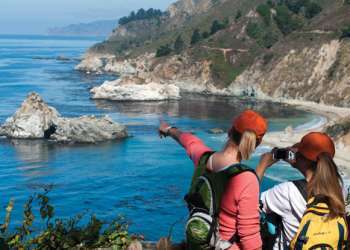 Nearby options in Carmel-by-the-Sea, Pacific Grove and Monterey also provide easy access to the tournament.